It took me long time to create Good and Geeky iPad Artist because I was spending so much time using the art tools to create art. I have the Apple iPad Pro and the Apple Pencil and it is so easy to get lost in the fantastic applications available. I found I jumped into applications like Procreate and iColorama and two or three hours later I would still be there drawing and painting on my iPad. I am a good and geeky iPad artist. In the book I talk about a couple of different styli you can use. If you have one of the pro versions of the iPad then you really do have to get the Apple Pencil to be a proper iPad artist. One of the things that really makes a difference is being able to rest your hand on the screen while you are drawing. The only marks that arrive in the drawing are from the Apple Pencil. There is such a range of applications available for creating art on the iPad you’ll never be stuck creatively. Use the iPad as a sketch pad, sitting in front of your subject and draw onto the screen. There are huge advantages over using analogue means of drawing. The same combination of the iPad plus the stylus or the finger gives you an unlimited variety of pencils, pens, brushes, charcoal sticks, colours and paint. It’s so easy to change the width of your drawing line either by using the pressure sensitivity or by changing it in the settings. By using the Apple Pencil you’ll be able to unlock your creativity in the iPad art applications. Pixelmator for iPad and Procreate are my favourite applications for drawing and painting. I also like Tayasui for its watercolour brushes. iColorama is a particular favourite of mine because it does just about everything. ArtRage is fantastic for its virtual paint which gives you a realistic view of painted brushstrokes. If I want to do any type of vector drawing then I will open up the application Graphic which is by Autodesk. The application Paper by 53 is a favourite with many people but it’s not something I have warmed to. Which of these applications I would use really depends upon what it is I’m trying to do. There will also be times when with a particular piece of art I will move between two or three applications. It’s easy to move work from one app to another. If you’re looking for a specific effect not available in the main application you’re working with, send it out to another iPad artist application. Bring it back into where you are working when you’ve got what you wanted. It’s really helpful to build up a drawing starting with a rough layout of the main shapes. You can progressively build on top of that by using layers in whichever iPad artist app you are using. You gradually build on top of previous layers to get the drawing just right. The final layers are to add the details. Another great thing about layers is if you need to go back to a previous part of the background, you can do so without destroying the details on top. Fill in an area of colour or change a colour where necessary achieving effects quickly. By being an iPad artist the technology enables your creativity and doesn’t slow you down. You don’t have to spend time cleaning brushes, sharpening pencils or rubbing things out. It’s nice not to have any roadblocks in the way of making art. Not only do you have marvellous drawing and painting capabilities with your iPad, you also can work with photos creatively. The tools you have available are much more interesting and powerful than you find in some applications where all you get is a set of filters. With iColorama you can push pixels around to your hearts content. You can do the same sort of things with the distortion tools in Pixelmator for iPad. It’s even possible to remove objects from within a photo so you’d never be able to tell they were there in the first place. Another useful area of photographic art manipulation is with the blending modes for the layers. The best art applications for the iPad let you set the blend mode. This will change the way that two layers interact with each other in terms of colours, tone and light. If the top layer is set to multiply you get a completely different effect from when it is set at normal. In the book I show you how to create a caricature. 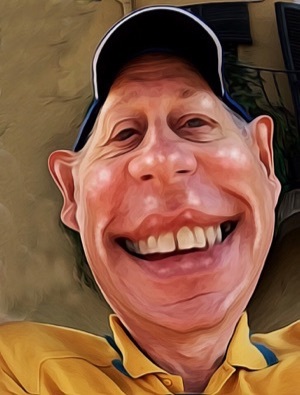 There is a video showing you how I took a photo and turned it into a caricature image using iColorama and Pixelmator for iPad. There are other videos within the book also. There’s lots of pictures in the iPad Artist book showing you how to use the various applications. Examples of artwork I’ve created using my favourite iPad art applications. The idea is to whet your creative appetite and get you excited about being a good and geeky iPad artist. You may still get the urge to scratch some drawings onto paper with analogue tools now and then. After seeing what you can get from creating with the Apple Pencil on the iPad you’ll agree that going digital is the way forward.